This is similar to the mobile telecenter model, where a truck goes around offering internet services. Nearly everywhere it has failed because of the mobile phone. 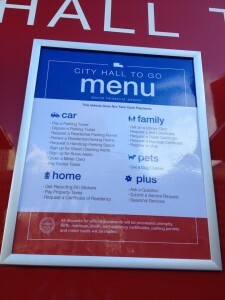 I don’t get why this would work when nearly all the services on the truck’s menu could be offered by cell phone – e.g. paying parking fines, applying for birth certificates etc. With many developing countries reaching close to 100% mobile coverage, why waste money on a truck that covers a miniscule portion of the population at relatively high expense when a mobile phone could cover nearly every one? This could be a great way to get the new BC Service ID card out to the public – go to where they are.